Malaysia is renowned for its many exquisite arts and crafts. This multicultural nation is home to various different races and ethnicities and hence has a rich tradition of arts and crafts. Souvenir items like batik, songket, pewter items, silver ware, wood carvings and more are immensely popular with tourists to the country and are produced by various different communities in Malaysia. Relief wood carvings are popular adornments on traditional Malaysian homes. Popular motifs on these reliefs include designs based on much native flora and fauna. Some of the best Malay wood carving hails from the states of Kelantan and Terengganu in Eastern Malaysia. The art of fashioning wood carvings is usually passed down through generations. Wood carvings in Malaysia are classified into two segments namely ukiram halus(fine wood carving) and ukiran kassar( rough wood carving). While fine carvings adorn hilts of Malaysian daggers, headboards and cupboards, the rougher but by no means less skillful carvings adorn larger areas like furniture, pillars, windows and roofs. Wood carvers in Malaysia also tend to work on certain well-established principles. Carvers follow the basic design principles of ‘awan larat’ (extending clouds) and its usage in a composition are dictated by four main guidelines, the design element must feature evenly in the composition, the empty spaces in the unadorned areas must measure the same as the carved areas, no animals or humans can be depicted in the design and a central motif should be surrounded by secondary designs. Carvers generally use Malaysian woods like Cengal or Balau or perah for their carvings. Malaysia’s many orang asli or indigenous peoples are also known for their beautiful wood carvings. 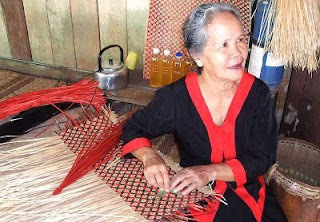 Tribes like the Mah Meri of South Selangor and the Jah Hut of Pahang, along with other native tribes who are resident in Sarawak are especially known for wood carving skills. These handcrafted delights can be purchased at various souvenir stores all over the country. Malaysia’s rich, opulent fabric Kain Songket is well-known throughout the world. Once used to create robes and garments for Sultans and other royalty, this sumptuous fabric is today fashioned into jackets, vests, bow ties, evening gowns, table cloths, handbags and more. Songket is especially popular in the eastern states of Kelantan and Terengganu where it is hand-woven incorporating gold and silver threads by skilled artisans. The Eastern Malaysian state of Kelantan is renowned for its many skilled silver smiths. Even today these skilled craftsmen handcraft silver broaches, rings, ‘keris’ sheaths, table ware and other items from silver derived from bars and ingots. 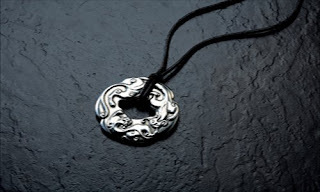 Despite the advancement of machine-made technology, people continue to appreciate silver items handcrafted by the talented silver smiths of Kelantan. Pewter, a malleable alloy derived from tin is widely available in Malaysia as the country as long been a center for the tin-mining industry. Talented crafts people fashion this luxuriant, matte metal into items like boxes, vases, tableware, candle stands and more. All of which are hugely popular as souvenirs from Malaysia.